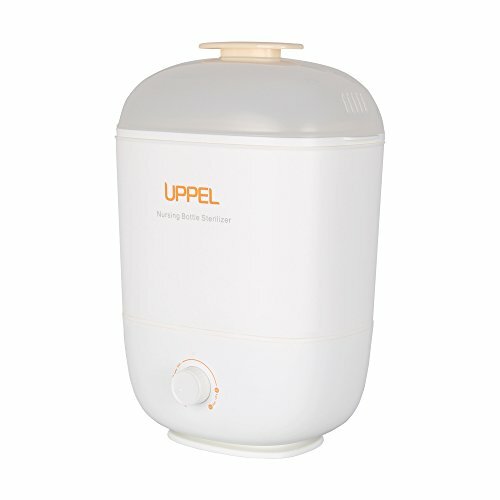 Uppel Steam Sterilizer and Dryer kills 99.9% of harmful germs, operating at a higher temperature than dishwashers. Sterilizing 6-8 bottles at the same time and three type of using meets your different capacity needs. Come sterilize and dry your baby's bottles in one step. Set the machine once and walk away, and it will automatically moves from sterilizing mode to drying code and automatically powers off when it's done. Natural steam provides effective sterilization. The baby product will be soaked in steam in at least 10 minutes to kill 99.9% of germs in bottles. Also Uppel Steam Sterilizer is BPA free, making sure that the bottles come out perfectly non-toxic. Operating Time:10-60 Minutes, depends on the time you choose and the items to be loaded. Effective Sterilization: the intense steam eliminates 99.9% of harmful bacteria, and it can be used as Sterilizer Only, Sterilizer and Dryer and Dryer Only. Super-Large Capacity: can accommodate 6-8 bottles at the same time. Also, you can put in kids' toys even travel accessories. Easy to Use: add water, put in everything you need to sterilize, choose the mode you need, and just walk away. Safety: BPA-FREE material promises a non- toxic sterilizing environment. 3 in 1 adjustable modular design allows provides a sterilization-drying cycle and avoids bacteria spreading across the bottles while they are still wet. A perfect Christmas gift for baby girls and boys.